Maps can communicate ideas instantaneously. Metes and bounds on the other hand, while necessary as a legal recording of property, read like a foreign language to the uninitiated. Points beginning here or there, and then north for a certain number of degrees, and west for some more, etc. etc. Good for the surveyors, but what about the rest of us? Planners understand this, and many cultivate a love of maps at a young age. Residents and local officials, who know their communities better than anyone else, can still learn a significant amount of new information, or recognize unnoticed patterns in their urban makeup, by analyzing a well-made map. Mapping software, in the form of Geographic Information Systems, better known as GIS, is more powerful than ever. However, it is also pricey and inaccessible for many smaller communities. This is one area in which the Maryland Department of Planning (Planning) can help, and did so in collaborating with the Town of Williamsport in Washington County. Williamsport officials approached Planning’s Western Maryland Regional Office in July to assist in reviewing the town’s existing land uses, as well as land uses within one mile of Town, to determine if there were any developing changes in Williamsport’s neighborhoods. To achieve this, the Planning Commission requested an updated land use map to compare any changes from the last land use survey, completed in 2010, and the town’s current zoning districts. Land use maps typically show the type and intensity of land uses (residential, commercial, industrial) within a defined area; such as a county, city, or neighborhood. Town officials wanted the map to correlate with their 2010 Comprehensive Plan . Demonstrating foresight, they also envisioned one that was digitally editable, permitting alterations as conditions changed. Williamsport is a moderately sized town, with a population around 2000, but that does not mean the area has simple land uses. On the contrary, the final land use map (see above right), including the one mile around the town, highlighted 16 different land uses ranging from environmental conservation to industrial. Planning staff embraced the opportunity to provide technical assistance that could make a big difference in a small community. Planning has an agreement with Washington County, in which Planning shares state GIS data with the County, and the County reciprocates with its own GIS data. 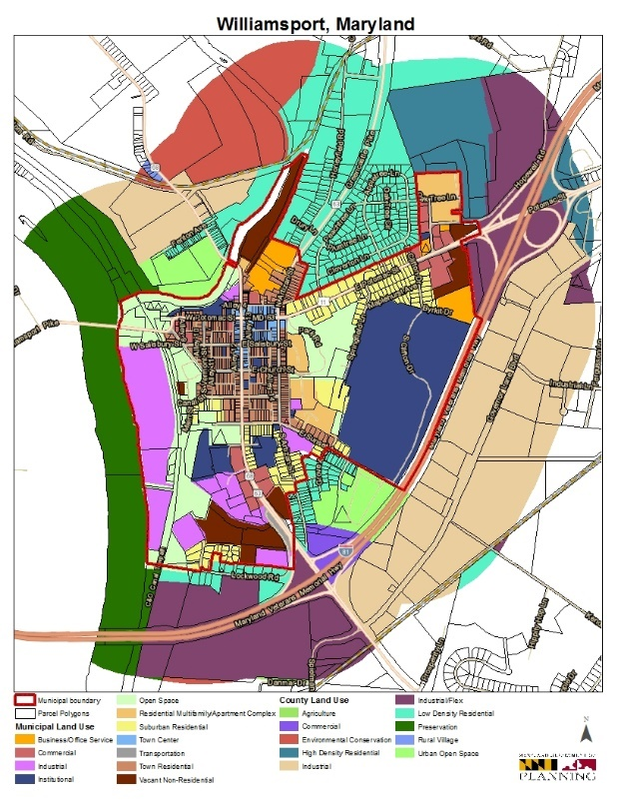 Western Regional Office staff requested the latest land use and growth boundary data in and near the Town of Williamsport from the County GIS Analysis. Planning staff then used that data to complete the requested land use map. As a final step, Planning verified the mapping by conducting site visits and meeting with the Planning Commission, mainly Chairman Jerry Stumbaugh. At a Town Planning Commission Meeting on August 7, Western Maryland Planning staff presented the draft land use map. The map informed multiple Council discussions. In response to the map’s highlighting of Williamsport’s historic core, the Council considered their Historic Preservation Ordinance. At the same meeting, the Commission also requested another land use map indicating parcel identifiers, which Planning supplied the following week. In addition to using the map to communicate its Comprehensive Plan and support its discussion on Historic Preservation, Williamsport also intends to use the map, specifically the editable one, to support a continued dialogue about any needed adjustments in the zoning ordinance. Jerry Stumbaugh, Chairman of Planning Commission for the Town of Williamsport, told Planning staff that “this map will be helpful in more ways than you can think of, and even that I can think of, because we will be able to change it as needed moving forward” Planning strives to provide the tools and resources that Maryland jurisdictions need to foster homegrown and effective planning in their own communities. If we can develop that capacity, we are doing our job. This map says that loud and clear. To learn more about this project or other mapping efforts of the Maryland Department of Planning, please contact David Cotton at david.cotton@maryland.gov or (301) 777-2162 or Audrey Graham at audrey.graham@maryland.govor (410) 767-6520.